Hockey Blog In Canada: It Might Be A Penguin? It was twenty years ago when the Penguins rolled out new uniforms and a new logo to start the 1992-93 season. I hadn't realized that it had been that long had it not been for a tweet from Icethetics about it. While Icethetics breaks down how the new image of the Penguins came about, I have a more unique view on this change since I've been a Penguins fan for approximately all my life. While some may view the new logo as the Pittsburgh Pigeon or the Robo-Penguin, I view it as the "Dark Era" in my life as a Penguins fan. First off, I was quite shocked when I found out that it had been twenty years since this logo first appeared. I fondly remember the Stanley Cup Final against the Minnesota North Stars as the first sign that the Penguins were a dominant team, and they were destined for a long run of success. The skating penguin logo was etched into my mind, and my room had posters of Lemieux, Francis, and Jagr all over the walls. After dispatching the Blackhawks in four games in 1992, the Penguins appeared to be building a dynasty. After steamrolling their opposition in 1993, it appeared that the Penguins were on their way to a third Stanley Cup when David Volek of the New York Islanders shocked the hockey world. There were certainly some highs after that shocking loss in the second round to the Islanders, but they were few and far between. There were some amazing players who wore Penguins colors for a short time - Luc Robitaille, Tomas Sandstrom, Petr Nedved, Alex Kovalev, Sergei Zubov, Markus Naslund, Glen Murray, Darius Kasparaitis, and Stu Barnes to name but a few - but none of them could propel the Penguins further than the Eastern Conference Final. April 7, 1995: Martin Straka to Ottawa for Norm MacIver and Troy Murray. July 8, 1995: Larry Murphy to Toronto for Dmitri Mironov and a second-round pick. March 20, 1996: Markus Naslund to Vancouver for Alek Stojanov. June 22, 1996: Sergei Zubov to Dallas for Kevin Hatcher. January 27, 1997: Tomas Sandstrom to Detroit for Greg Johnson. March 18, 1997: Glen Murray to Los Angeles for Ed Olczyk. March 11, 1999: Stu Barnes to Buffalo for Matthew Barnaby. March 14, 2000: German Titov to Edmonton for Josef Beranek. July 11, 2001: Jaromir Jagr and Frantisek Kucera to Washington for Kris Beech, Ross Lupaschuk, and Michal Sivek. March 19, 2002: Darius Kasparaitis to Colorado for Rick Berry and Ville Nieminen. March 19, 2002: Stephane Richer to New Jersey for a conditional pick. February 10, 2003: Alexei Kovalev, Janne Laukannen, Mike Wilson, and Dan LaCouture to New York Rangers for Joel Bouchard, Rico Fata, Richard Lintner, Mikael Samuelsson, and futures. Make no mistake that Pittsburgh gave up a ton of talent in approximately nine years. They got some back, but the vast majority of their trades were for cost-cutting reasons and because they were teetering on bankruptcy. Consider, though, a team of Straka, Murphy, Naslund, Zubov, Sandstrom, Murray, Barnes, Titov, Jagr, Kasparaitis, Richer, and Kovalev for a moment. Two of those players are still playing, and they have won a ton of hardware while playing in the NHL. Compare that to the team of Stojanov, Hatcher, Johnson, Olczyk, Barnaby, Beranek, Beech, Lupaschuk, Sivek, Berry, Nieminen, Bouchard, Fata, Lintner, and Samuelsson. Not much of a comparison, right? A team of Hall-of-Famers and fantastic offensive talents versus a squad of mostly AHLers. Any wonder why Pittsburgh was horrible for nearly a decade? I will say that I never lost faith in finding the light at the end of the tunnel, and it appeared that there could have been moves to several cities, including Winnipeg and Kansas City, had the team and city not worked hand-in-hand to get an arena built and the franchise sold to stable, responsible owners. I have several Penguins jerseys with the modernized Penguin on them, and I have a diagonally-written Pittsburgh uniform as well. To think they came out twenty years ago makes me really feel old now. You kids leave those Penguins alone. And get off my lawn! 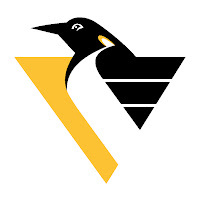 I first really got into hockey when my Panthers joined the league, so this is the Penguins logo I first learned about, and still think is perfectly fine and modern. The skating penguin is okay, and certainly retro, but not what comes to my mind first. I never liked Lemieux or Jagr back then, and therefore still hate the Penguins (and Steelers! ), but know they are a strong team. I just hate seeing them win! And I also really dislike how Florida copied the Pens' baby blue jerseys for the alternates of recent years. That color has no history for the Panthers, and was a cheap marketing gimmick that I'm happy is gone. Pitt can keep that color!